For me, I've approached motherhood on a need-know basis. When our baby's newborn sleepiness wore off I read a sleep book, on his 6 month birthday I opened the "what to expect in the 6th month chapter", and when he was ready to eat solid food, I crammed through a few books. My mind doesn't have space or energy for what will happen later. Feeding a child is a big responsibility and I think most parents feel its weight. I always come back to the idea that whatever we give our children to eat becomes a part of them. That is a scary and powerful fact. 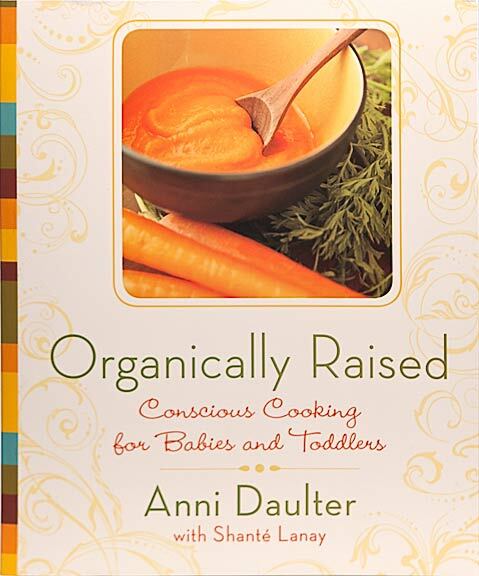 Anni Daulter's book Organically Raised is both a helpful guide and packet of inspiration. What I like about this book: 1. 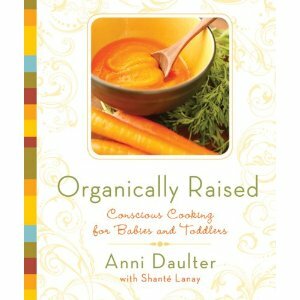 Practical information like when/how to start solid food, equipment to buy etc. 2. Special recipes including puree blends with cute names like "Spring Flight - kiwi fruit, pear and raisin" as well as plenty of easy toddler and big kid recipes. 3. 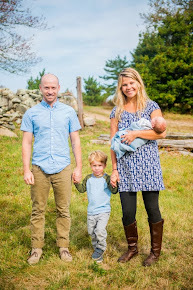 Fun tid bits to keep you reading like the mama mantra "I love this culinary adventure we are on together" and the kitchen mantra "Every meal prepared in this kitchen will be done with love, joy, and the intention of feeding my family in body, mind, and spirit." Maybe that last one is too spacey for you but I think we should all hang a mantra in our kitchens to remind us of what we're doing, don't you? Ps. Maybe a nice time to think about eating organic food? I wanted to make an easily portable and healthy snack for Dylan to take to the park or enjoy while reading books. He LOVES these...I had to cut him off yesterday. *Nuts and honey are poo-pooed for babies under 1. Check with your pediatrician on how to approach these foods after 1 year. 2. Mix the almond butter and honey in a medium bowl. Set aside. 3. Place the coconut, oats, wheat germ, pistachios, and cocoa (if using) in a medium bowl. Mix well. Pour on a baking sheet. Bake for 5 minutes, or until the mixture is toasted to your liking. 4. Form a small ball of the reserved almond butter-honey mixture in your hands. Roll the ball in the toasted coconut-oat mixture. Make as many balls as you have batter for. 5. Place the balls in the freezer to chill. they will firm up but not freeze. Transfer to fridge and serve cold. I made these and my daughter and I loved them. I am not sure, though, how you managed to roll a ball of the almond butter mixture. Mine was a gloppy, sticky mess. I thought it might be because the agave nectar I used is more runny than honey, but I tried again with honey with the same result. I ended up using two spoons to scoop a bit of the mixture, and then plop it into the oats, gathering up some of the oat mixture to moosh it all together. It ended up working ok, but they certainly aren't spherical. I'm sorry they were a bit frustrating but glad your daughter liked them! Good question about the sticky challenge. All almond butters are different so depending on the brand they'll be firmer or runny. My suggestion is to fold some wheat germ (or a few spoonfuls of the rolling topping) in with the almond butter so it firms up a bit. I tried to act fast as the heat from your hands melts everything further.